Lily H. Liebman was a private and humble woman. She generally gave no indication of her wealth or of the traumatic experiences she endured as a teenager in Nazi-occupied Austria. She did, however, spend a great deal of time helping others, giving back to her community, and supporting the land and people of Israel. In November 2015, Lily passed away, but her legacy lives on with the more than $7 million bequest she left to Jewish National Fund in her will. Lily was just 17-years-old in 1938 when Hitler came to power, and her life in Vienna changed forever. While Lily, her sister Anne, and her parents were fortunate that no one came pounding on their door the evening of Kristallnacht, three of her uncles were not as lucky. They were among those rounded up and sent to the Buchenwald Nazi concentration camp. Soon after Kristallnacht, Lily and her sister went to the American embassy and began looking through the telephone books of New York City and Brooklyn, writing down the contact information for all the Hamermanns (their family name) they could find. They sent over 150 letters to strangers who shared their surname, asking for affidavits so they could make their way to America. Hope came in the form of a young man from Cincinnati. His parents had forwarded Lily and Anne's letter to him and he in turn shared their letter with the family he was renting a room from. The mother of the family, a complete stranger to these girls, decided to send them an affidavit. Anne arrived to Cincinnati in 1939, Lily in 1940, and their parents arrived in 1941. It was in Cincinnati that Lily and her family rebuilt their lives. Lily's parents started a wholesale clothing distribution company, similar to the one they had in Vienna. Lily married her husband, Eric, and the couple worked at the family store, later taking over the business. Lily volunteered her time helping immigrants from German-speaking countries with their pension applications, while Eric worked with the Munich 'Sister City' Association of Greater Cincinnati. Throughout her life, Lily purchased many trees for Israel and established charitable gift annuities with JNF. The ultimate and most significant show of her support was the bequest she left to JNF in her will. Lily understood and recognized the importance of Israel as the homeland and the only safe haven for Jewish people everywhere. 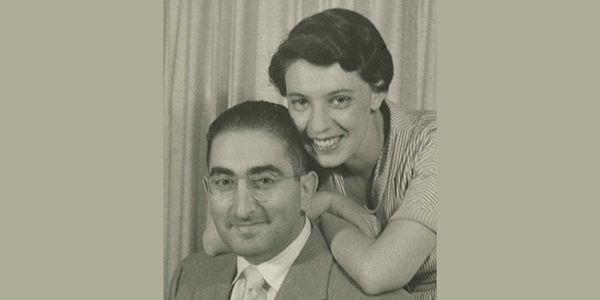 When it came time to plan for her and Eric's legacy, Lily immediately thought of Jewish National Fund and its invaluable work in continuing to safeguard our eternal homeland and to ensure that it thrives for generations to come.